A while ago I posted that I had succumbed to the hexipuff craze. 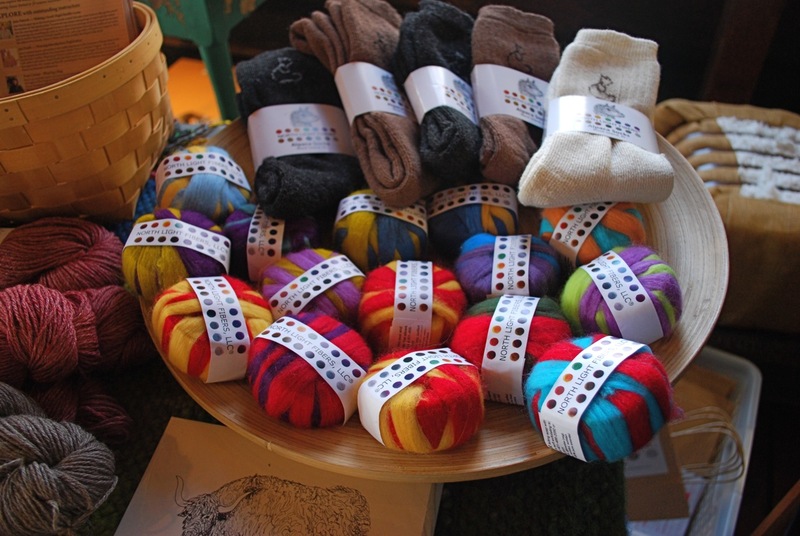 Adorable, squishy, mini pillows made from remnants of sock yarn. 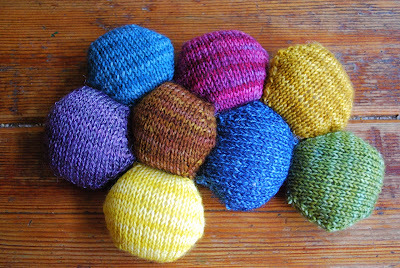 Hexipuffs are quick and easy - perfect for on-the-go knitting when your other projects are too involved. So what do you do when you have a collection of hexipuffs? Join them to form a Beekeeper's Quilt, of course. I'm a long way from a quilt. This doesn't even qualify as a doll blanket. But I'll keep making hexipuffs and adding to it as time allows. While I was making hexipuffs, I started thinking about another mini. Mini skeins. 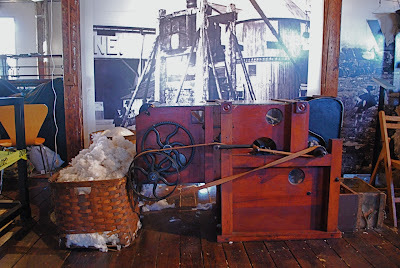 I spent a little extra time at the winder and may have gotten carried away. I now have a nice selection of mini skeins available in a range of colors and fiber blends - perfect for hexipuffs, embroidery or any other project where you need just a little bit. These minis will make a nice addition to my spring booth display. 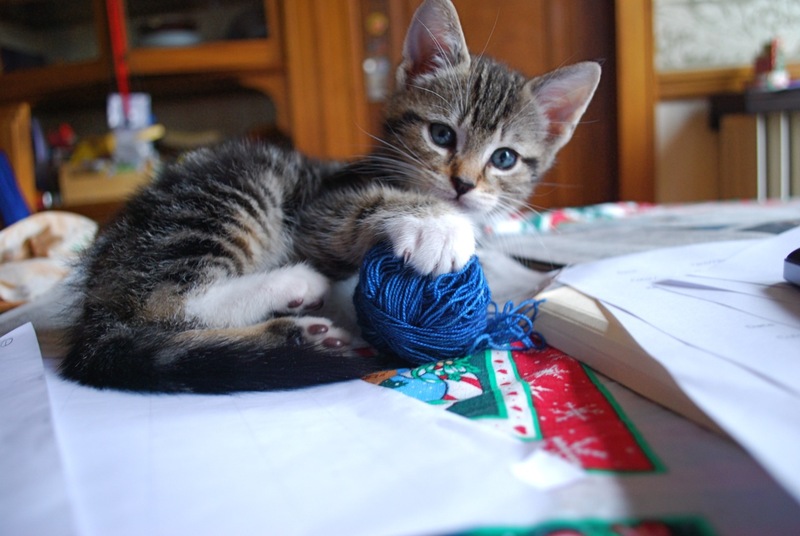 I'm trying to stay on course with my knitting time, but I've been tempted to stray. There are new projects and ideas. At first they start by whispering to me. When I don't respond, they loudly call my name. So far I've managed to stay focused, but my resolve is wavering. One half of Miss Doolittle. 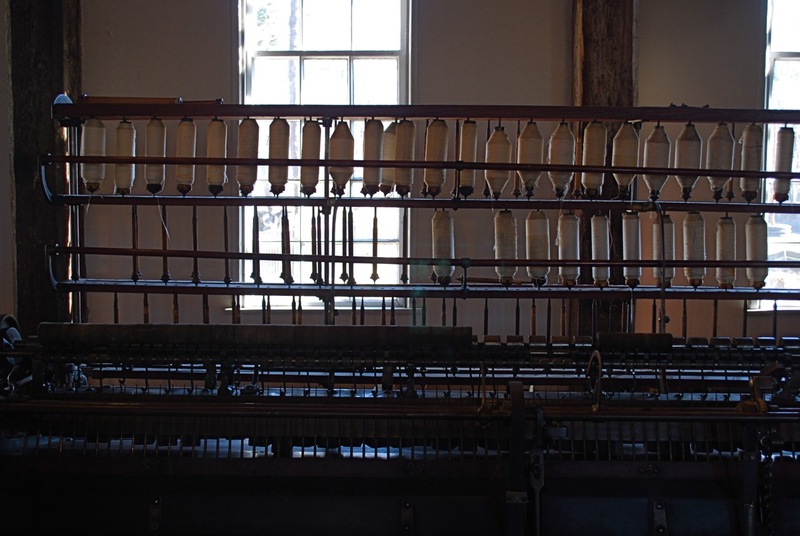 Note the live stitches on one end. I'm holding them on a spare cable for now. 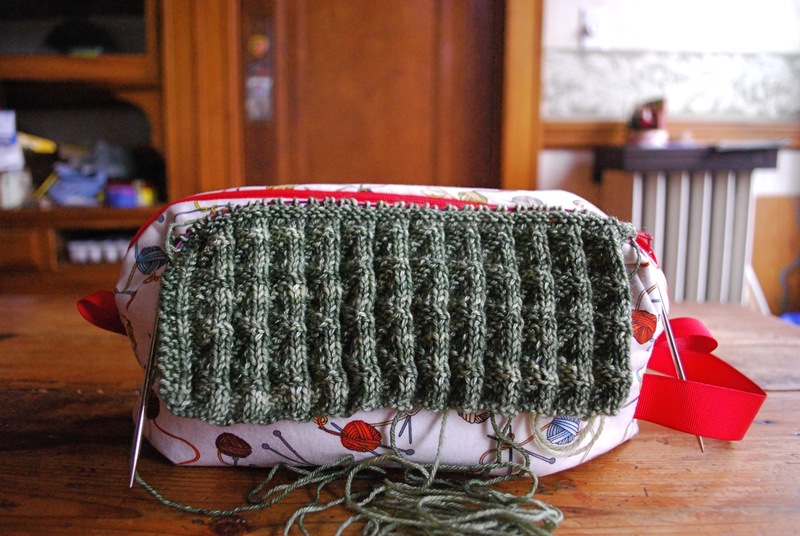 The scarf is knit in two pieces to keep the pattern moving in the same direction on both sides. 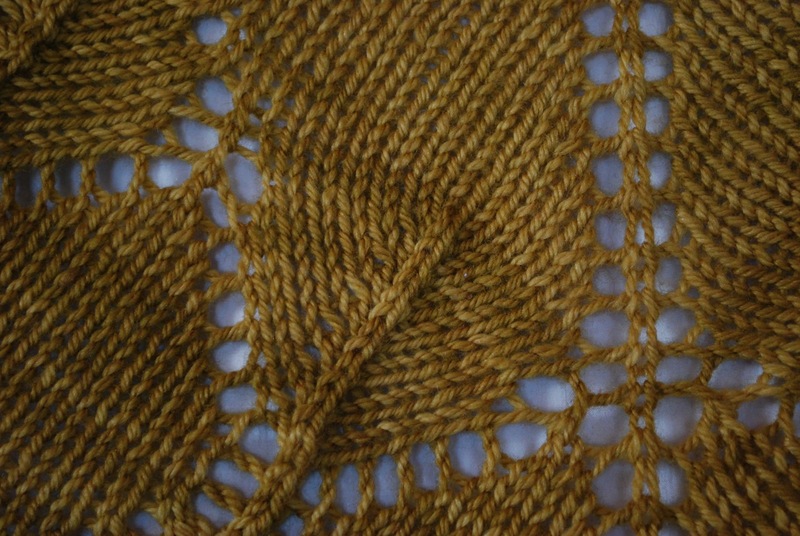 The bottom edge of the second piece is finished, and it's time to start the lace. After the second piece is finished, I'll graft the two sets of live stitches together. Soon enough. I have a chorus of new projects screaming for my time and attention. Lately buttons have been popping up here and there. A couple of weeks ago I found this button on a walkway. It's thick and hefty - probably fell off a coat. I liked the diagonal stripe and pocketed it to add to my collection. Just the other day a couple of buttons that I hadn't seen in a while surfaced. I vaguely remember buying them at a fiber event. This one features a purple butterfly. 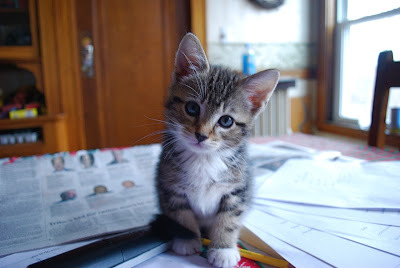 And this one a charming cat. Single random buttons with no purpose yet. They can all hang out together in my button bin. Then yesterday Becky Herrick posted about her search for buttons. The whole process has me thinking about which comes first - the sweater or the buttons. Becky says she sometimes has the buttons first and then the sweater comes along. I often buy buttons, especially vintage buttons, with no purpose in mind. I like them just to have them and don't expect that most of them will ever be used. Usually I knit a sweater and then go in search of buttons. Now I'm thinking of buying buttons that I really love and building a sweater around them. This has all the elements of fun and frustration. Either way it will be a challenging experiment. My color inspiration for the week reminds me of a maze. Mossy paths winding between rough rocks. Knitting projects move at different paces. Some zip right along. 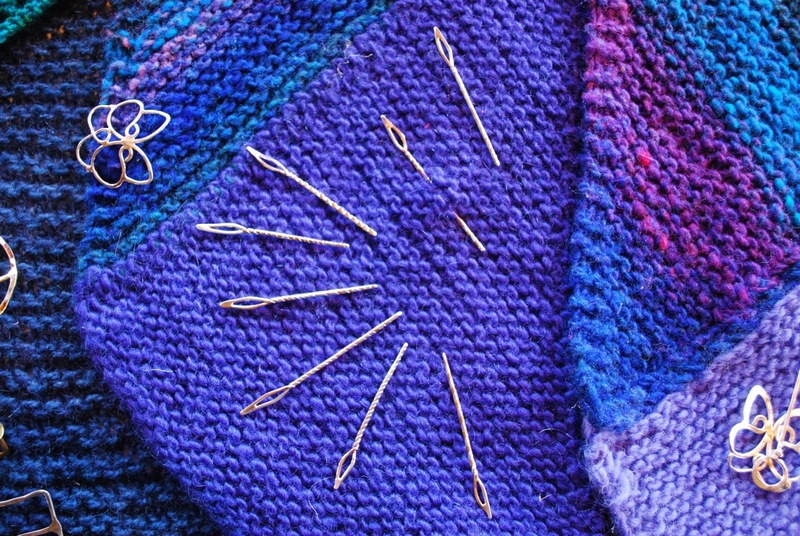 The yarn, the pattern or the combination of both makes it seem like these projects fly off the needles. There are the projects that drag. These are the projects that see action for a row or two and then get set aside. Often the time between rows gets longer and longer. Eventually they languish at the bottom of the project pile for an extended period. Then there are the projects in between. The slow and steady projects. These are the projects that get set aside temporarily. Their progress is halted by a quick hat, an emergency gift or a whim. They are quickly picked up again and worked on with fervor only to see another brief break in favor of some other project. Miss Doolittle. My slow and steady project. I love the pattern and am delighted with the yarn but progress is neither fast nor slow. I'm caught somewhere in the middle. 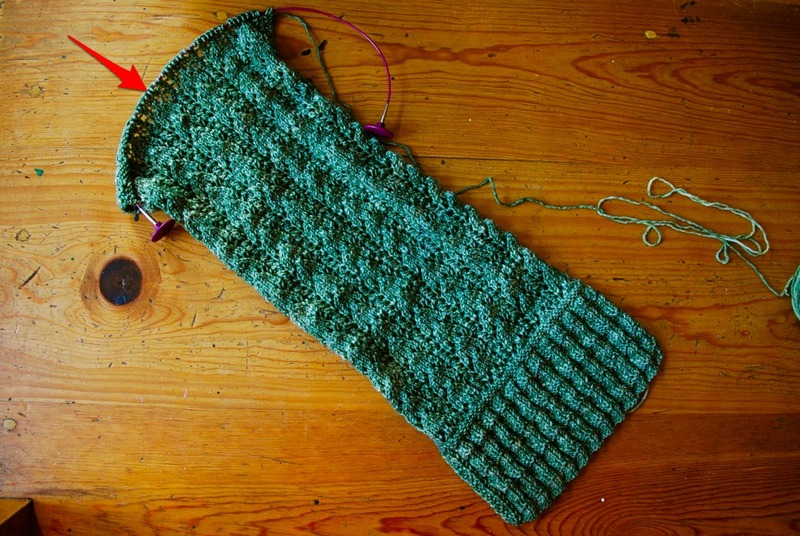 This could be the fate of most scarf projects - that place between beginning and end where you never seem to make any progress. 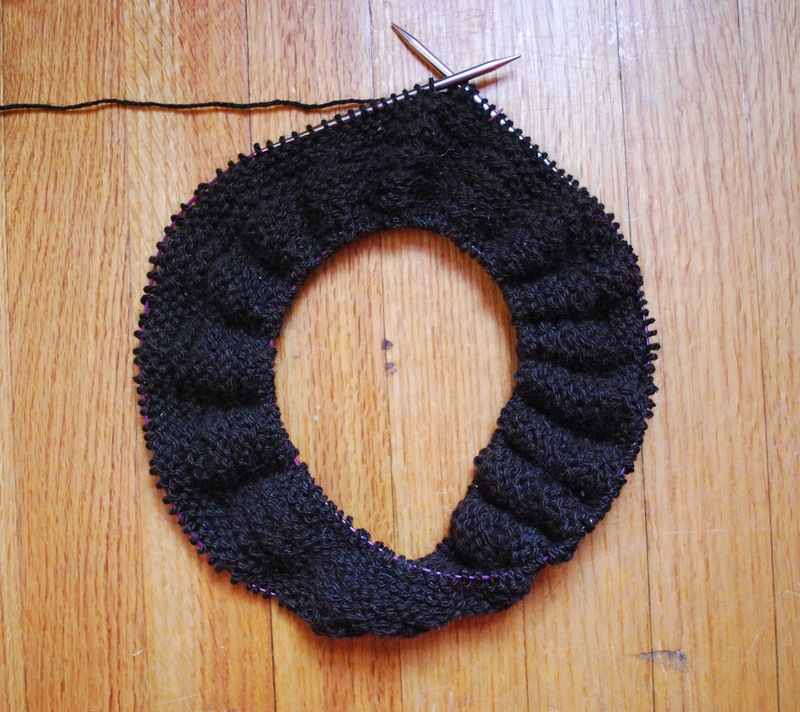 The black hole of knitting. Or it could be that I have commitment issues. If I didn't look at or even consider another project, I might make more progress on Miss Doolittle. Either way I know that this project won't see the bottom of the pile because eventually slow and steady makes it to the finish line. Sometimes when the inspiration for a new knitting project strikes, I can't say no. Such was the case last night. I had just wrapped up a string of long days with the dye pots. I was physically exhausted, and it probably would have been in my best interest to go to bed early for a change. But then a little light bulb went on. Wouldn't it be nice to start a new project - a small something with a little kick to make it entertaining. Never mind the booth sample in progress. Or the socks and mittens languishing in the bottom of my knitting bag. That light bulb grew into a floodlight, and I couldn't resist. 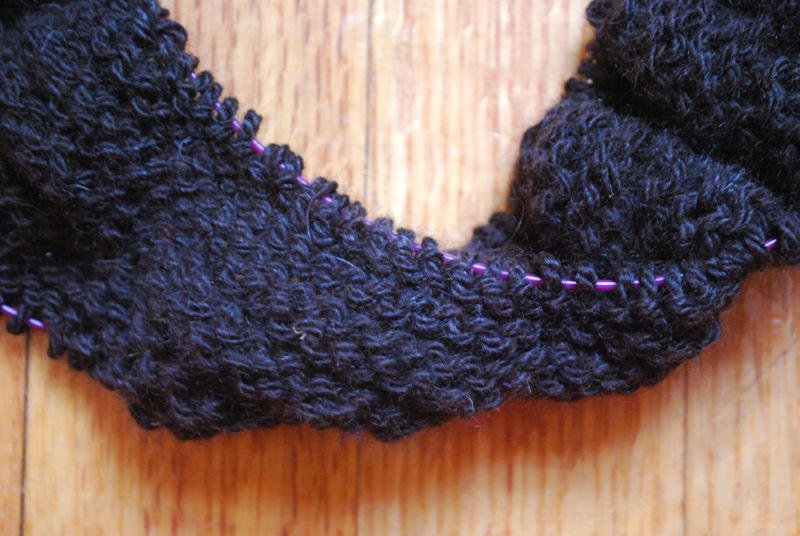 I cast on a Moebius scarf. Cat Bordhi is the queen of Moebius knitting, and I use her cast on instructions. 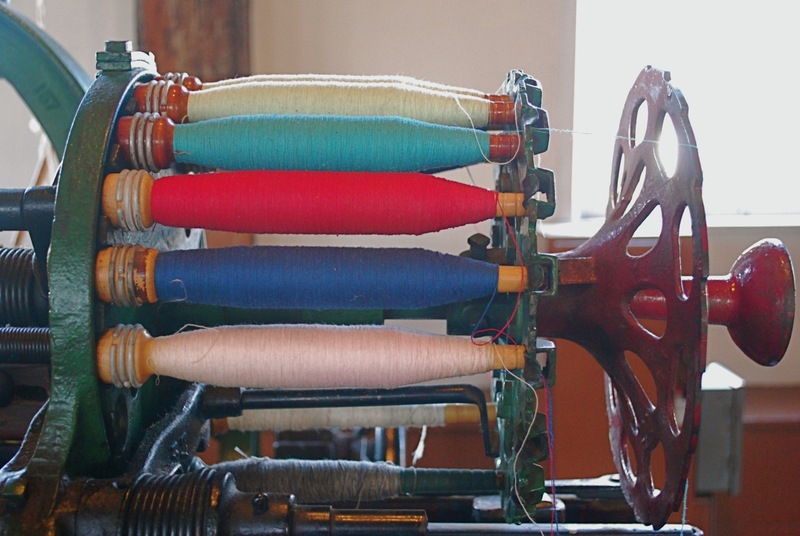 There is one long circular needle with two loops of stitches and a twist. 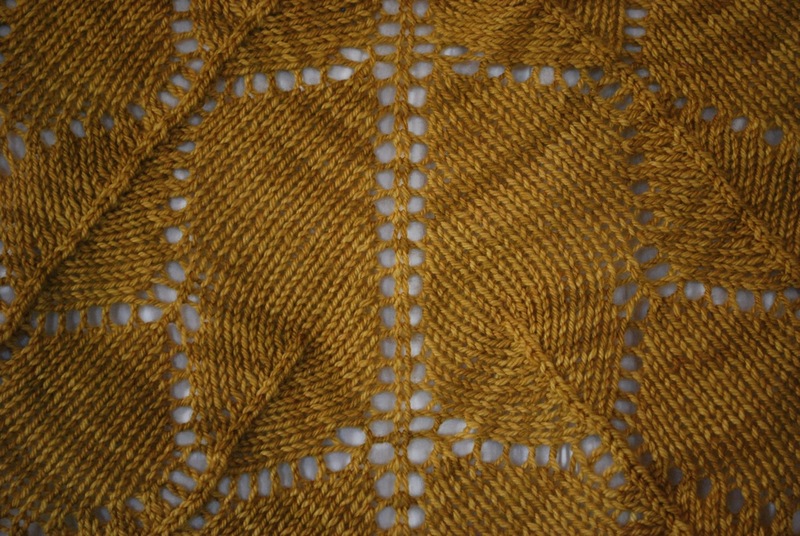 All I have to do is work the stitches as they come - the rest is magic. 'Round and 'round and 'round. Very meditative. Creating fabric with a built-in twist. Enchanting. Writing. Writing with pen and paper. Often I visit various coffee shops to work on this or that, and I'm surrounded by a sea of instant communication. Email, texting, tweeting, Facebook. Every once in a while I mentally leave the coffee shop to remember a time when I had to wait for communication in the form of a letter. As a young teenager living away from home for high school the Post Office was my lifeline to the outside world. I diligently wrote letters to family and friends. And then I would wait - wait for a reply. Every day at lunch I would check my mailbox, anxiously anticipating a letter or post card. I could always count on at least one letter a week from my mom, and often an aunt or grandma would jot me a note. Usually the news was routine - an update on daily life. It wasn't the content that mattered so much. It meant more to me that someone took the time and effort to write me a letter. Letter writing is a dying art, and my excitement for daily mail has waned. During the holidays I still get some "fun" mail, but even that isn't what it once was as people switch to electronic holiday greeting cards. These days the mailbox is usually full of junk and bills. Recently I came across A Month Of Letters Challenge. Mail at least one item on every postal day in the month of February. That's only 24 days. The item doesn't even have to be handwritten. This challenge has renewed my interest in mail and letter writing. I'm late to the party but have jumped on board for the rest of the month. Who knows. Maybe this will light a long-term letter writing spark. 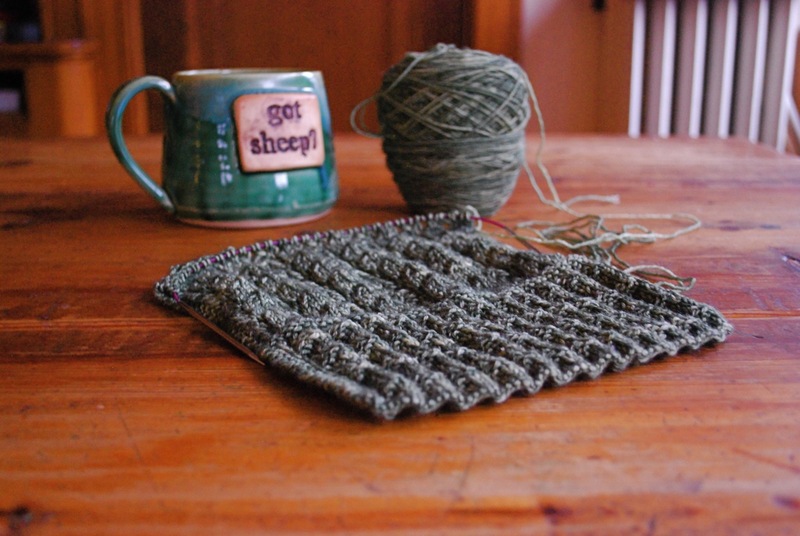 To enhance my letter writing quest I may be using Yarnvelopes for my knitting friends. An envelope that doubles as a record for a knitting project. What a clever idea! My color inspiration for the week comes from an old box at Slater Mill. 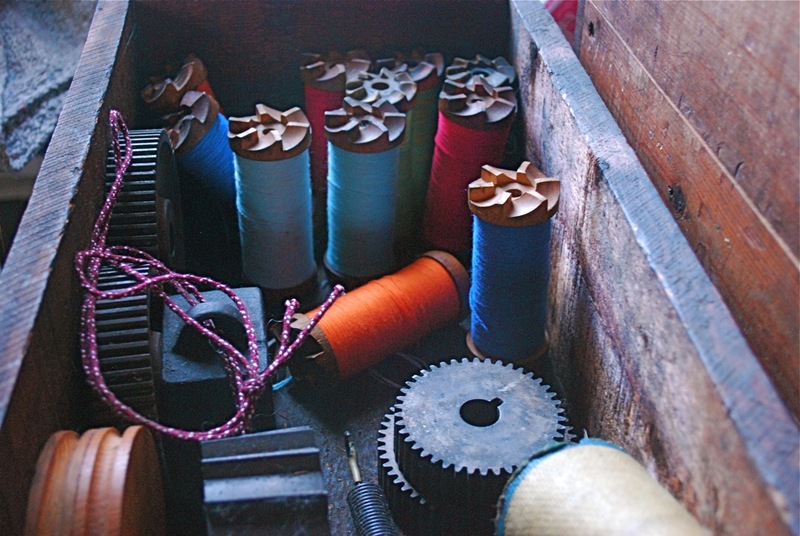 Colorful bobbins nestled amongst gears. 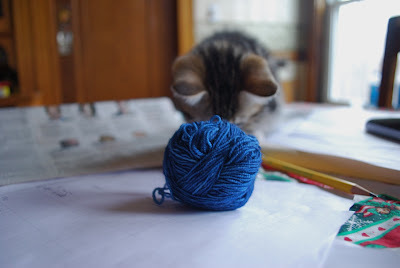 A new project and a new yarn. I'm so excited. I started this over the weekend in Rhode Island. By Sunday night I was a tad past the swatch stage. 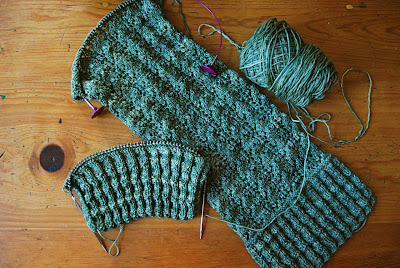 Last night was knit night, and I had ambitious plans. I was going to make significant progress on this new project. Often knit night is not the best place for production knitting. I know that. There's too much talking and not enough paying attention. Knit a little, rip out a lot. Note the pile of loose yarn in front of the bag. 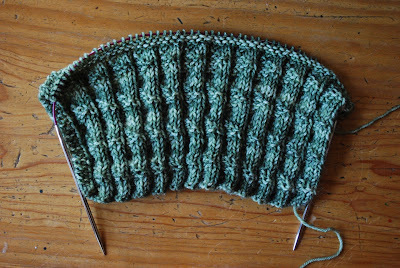 This pattern is not that difficult, but at the end of the evening I doubt I had made any forward progress. At times like this the only solution may be to lock myself in a room. 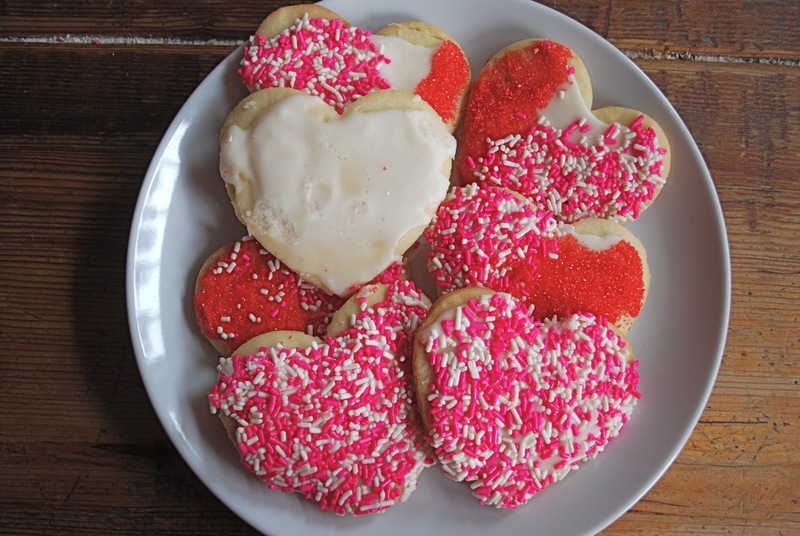 Maybe a couple of cookies will help. 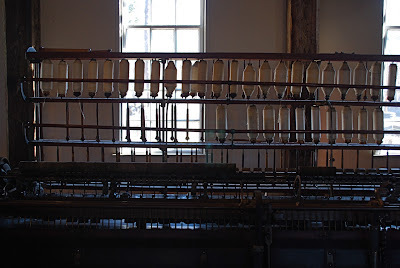 I'm back from a lovely time at Slater Mill. The weekend in pictures . . .
Slater Mill is located in Pawtucket, Rhode Island. The mill was the first successful factory in the US and produced cotton thread. 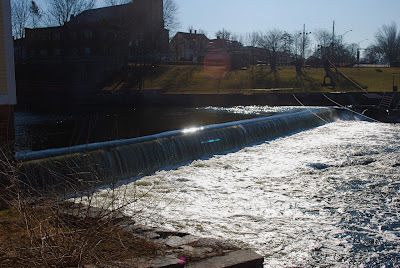 Where there's a mill, there's a river. 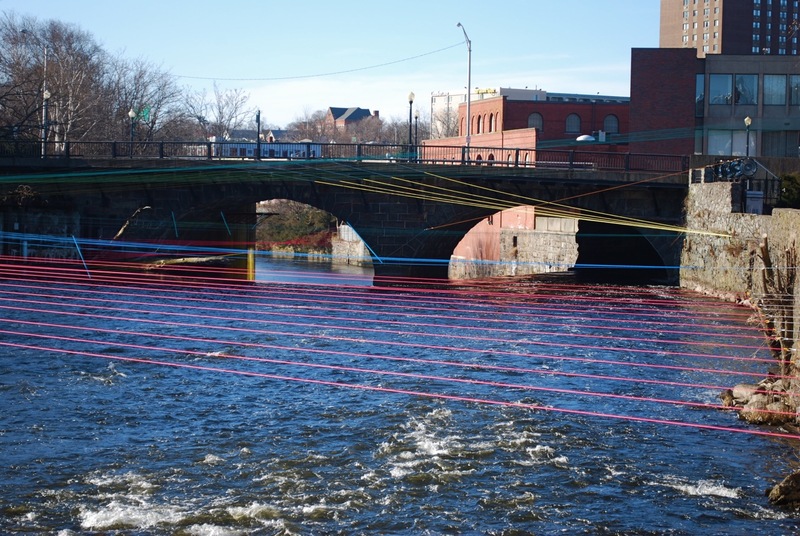 This river includes an interesting piece of art work. A thread-like sculpture spans the river. At night the sculpture is lit. You can see a nighttime shot here. The mill is also home to this appropriate spindle-like sculpture. 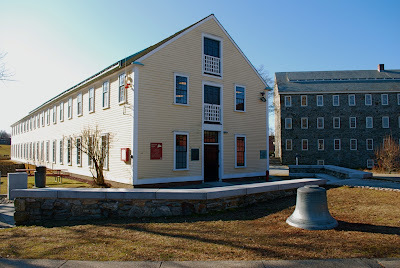 The inside of the mill has been restored. 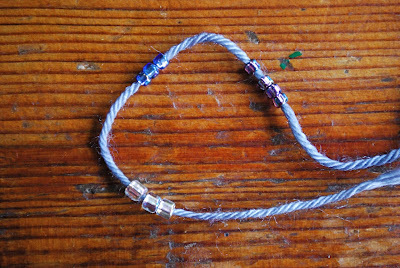 The weekend included classes on thrumming, finishing, knitting with beads and more. 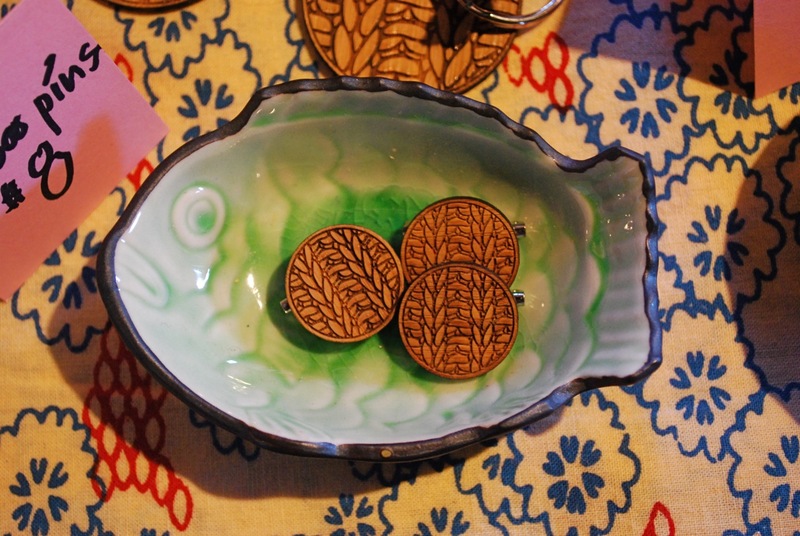 There was also a marketplace with a well-rounded mix of vendors. 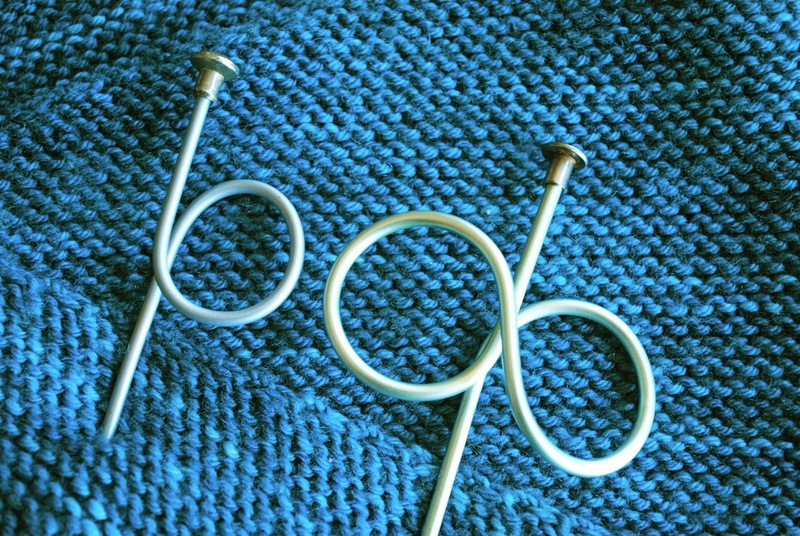 Knitting pins, buttons, key chains and more from Katy Westcott. 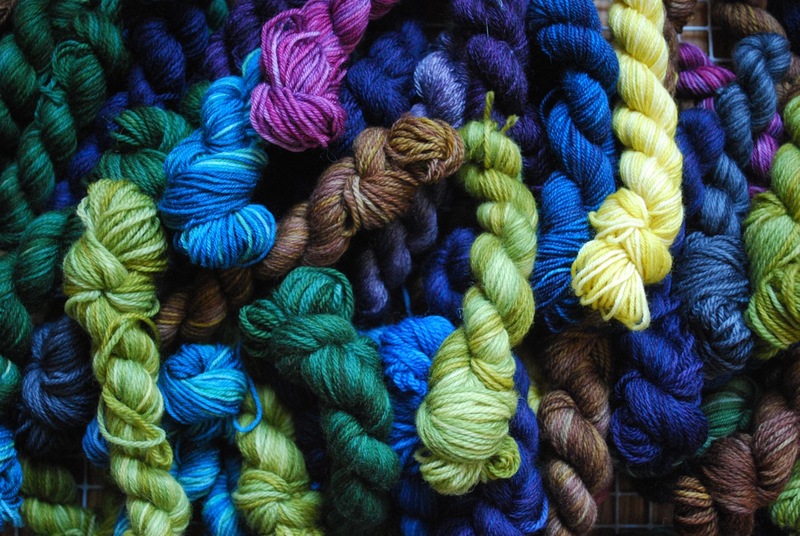 A colorful display from North Light Fibers. I lingered in their booth and came away with a yak blend yarn I couldn't resist. Leslie Wind was on hand. She had many goodies including these gorgeous yarn needles. There was a bit of construction going on in her booth. 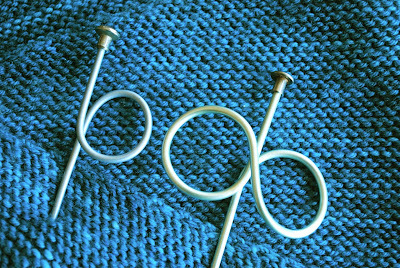 Vintage knitting needles repurposed on the spot into shawl pins. Nothing beats a relaxing weekend in a picturesque setting. 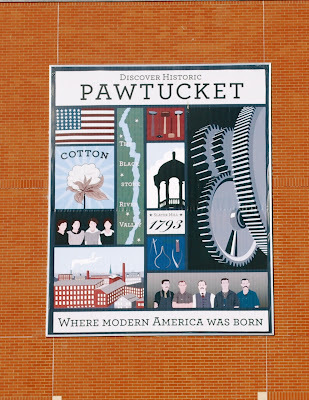 The fiber community in Rhode Island is very active, energetic and passionate. I enjoyed seeing familiar faces and making new friends. There was time to share knitting projects and opportunities for lively conversation. Thanks to all who helped make for such a wonderful weekend. 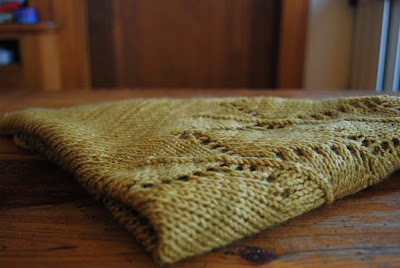 This week my knitting time has been focused on one and only one thing. 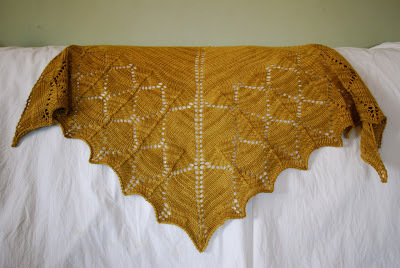 This lovely wrap is destined to be a booth sample. 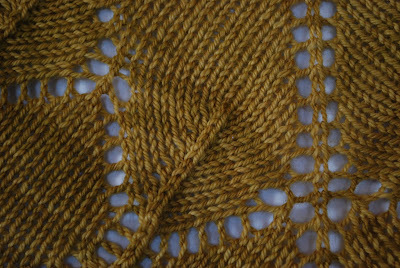 Once I got in the groove this pattern was a nice relaxing knit, but I did hit a snag early on. 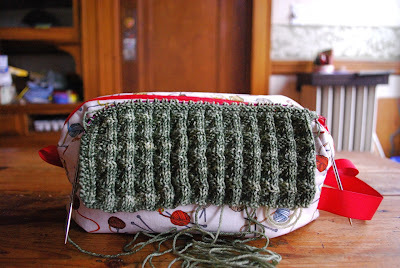 I had almost finished the first lace repeat when I decided to do a stitch count just to confirm that I was on track. I was off by one stitch. 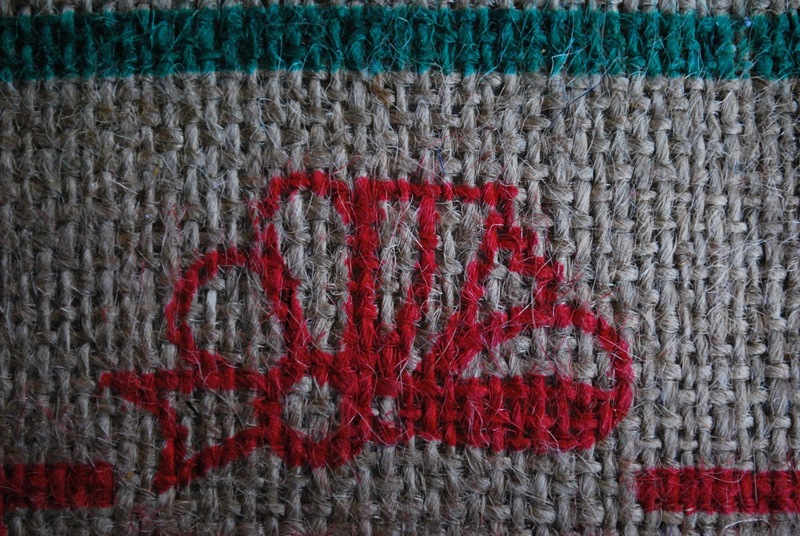 One little stitch. Nothing vexes me more. I counted and re-counted with the same result. In a moment of frustration I was tempted to rip back with reckless abandon to the beginning of the lace repeat - some 20 rows back. I figured the only place I could have gone astray was at the beginning. Instead of ripping I took a deep breath, put my needles down and walked away. When I came back, I decided instead to first rip back a couple of rows. Maybe, just maybe, the extra stitch would sort itself out. 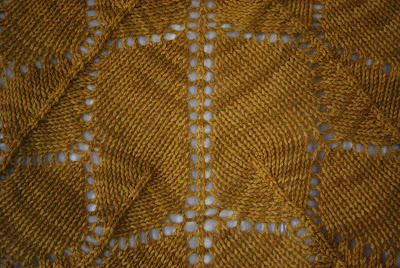 After ripping back four or five rows the extra stitch was gone, and my stitch count was correct. Order had been restored. I love it when that happens. I'm still not tired of working with Edna. This wool / silk combination is practical with a hint of luxury. I can't seem to get enough of it. 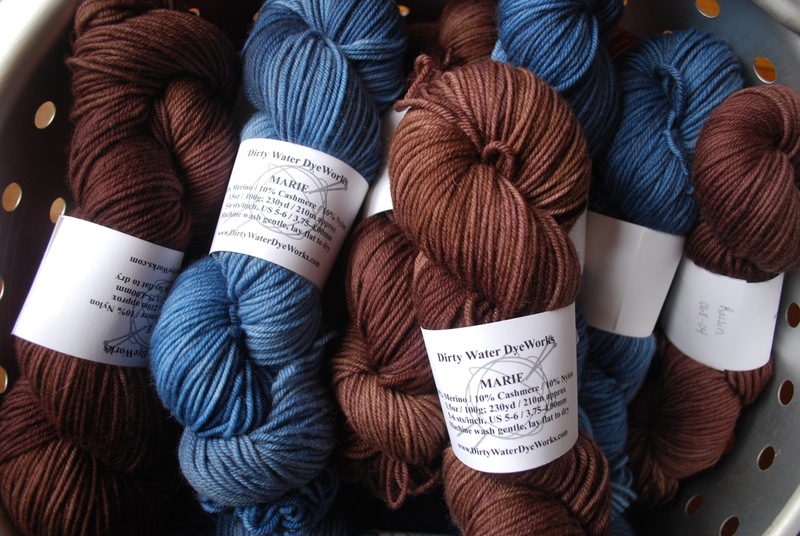 This weekend Dirty Water DyeWorks will be at the Slater Mill Knitting Weekend. The hours are 10:00 - 5:00 on Saturday and Sunday. 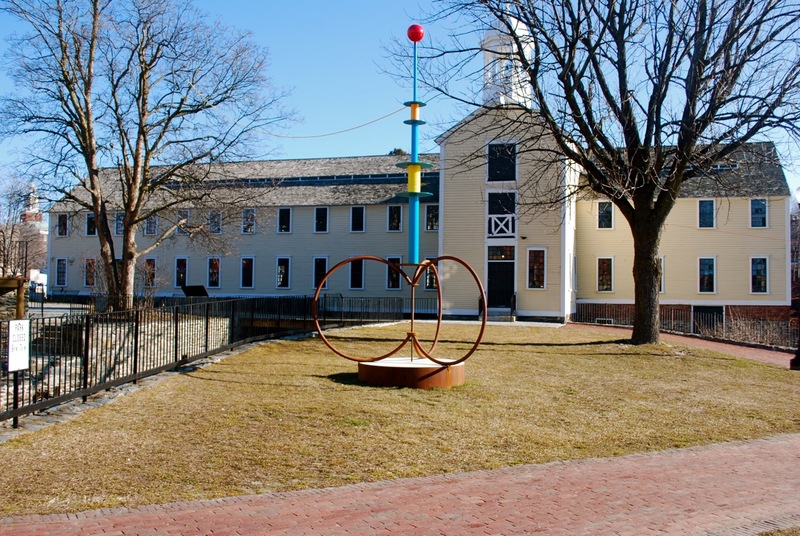 If you're in the area and need a fiber fix, be sure to stop by. See the link for more details. Sometimes the early bird gets the worm. Or a colorful sunrise shot. Early one morning I captured my color inspiration for the week. If you look closely at the bottom edge, you can see the colorful sky reflected in the river below. 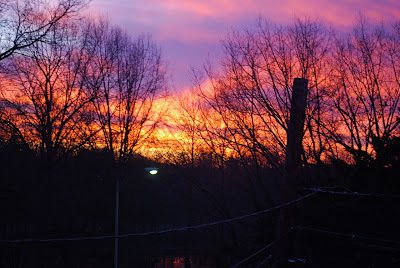 The color show lasted for just a brief moment, and then it was gone. I have a new project brewing. 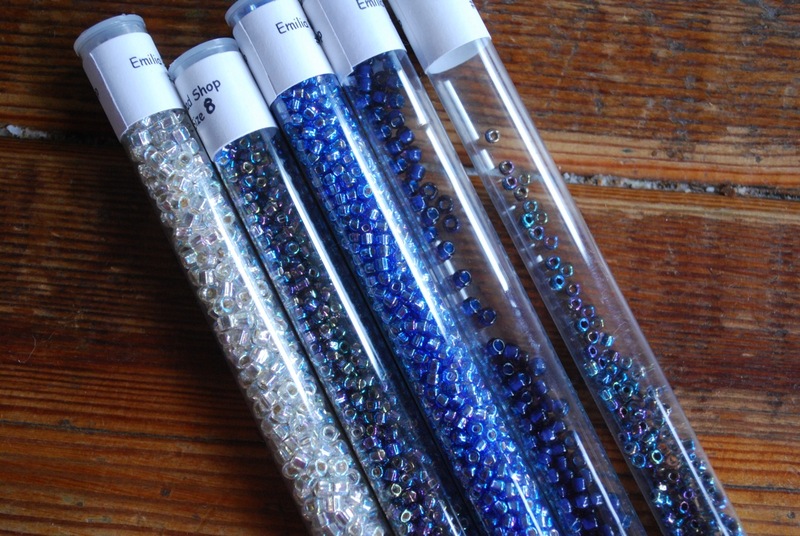 A new project that includes beads. Beads are a wonderful complement to yarn, and there are so many colors to choose from. Deciding which color to use is the hard part. 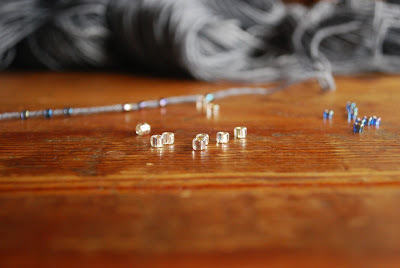 Beads can be tricky. They are transformed once they are on the yarn. 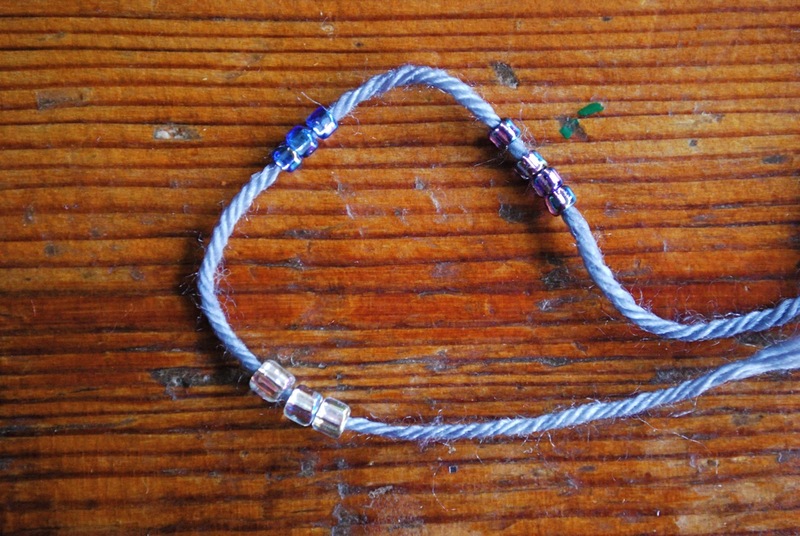 The off color in the tube - the one you swore would never be the right one - can turn out to be the perfect match when it's strung on the yarn. Likewise the color you thought was going to work beautifully can turn out to be a real dud. 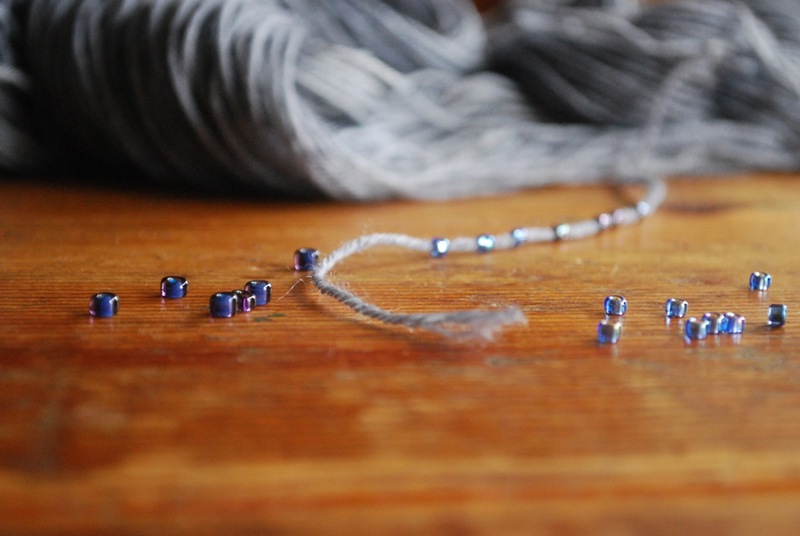 Sometimes the best bead color is no color at all. I never make a bead selection without first testing several colors on a strand of yarn. Even then the decision isn't always easy. I was on the fence with this one, so I took a poll at knit night. Sometimes you need a little help from your friends. Lately there have been some extra dye pots in the mix. Several new colors will be added to the lineup. To make room for the new a few colorways will go on hiatus. It's always refreshing to change the rotation. 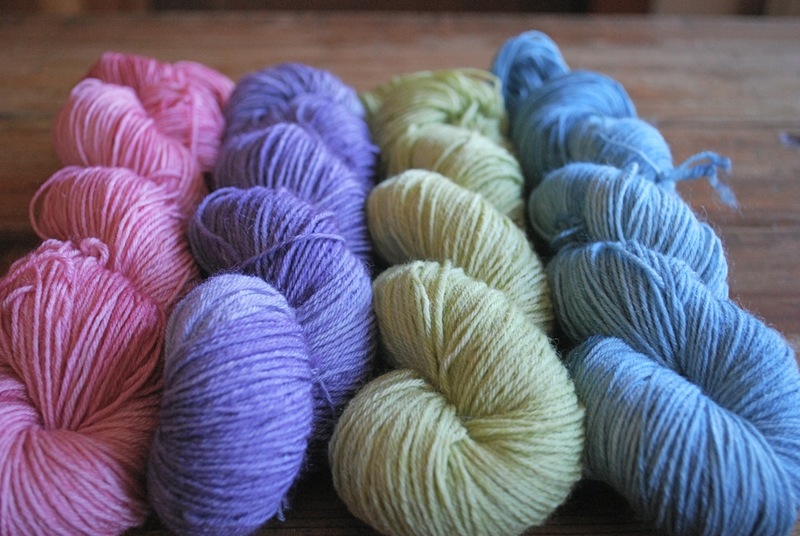 And I will be offering a new merino / silk blend. 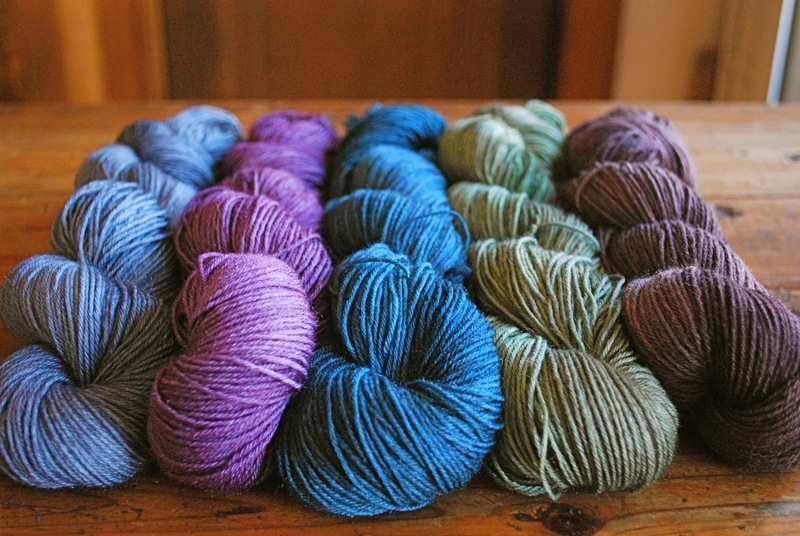 It's always exciting to pick and choose which new colorways to dye. There are so many choices, so many options. 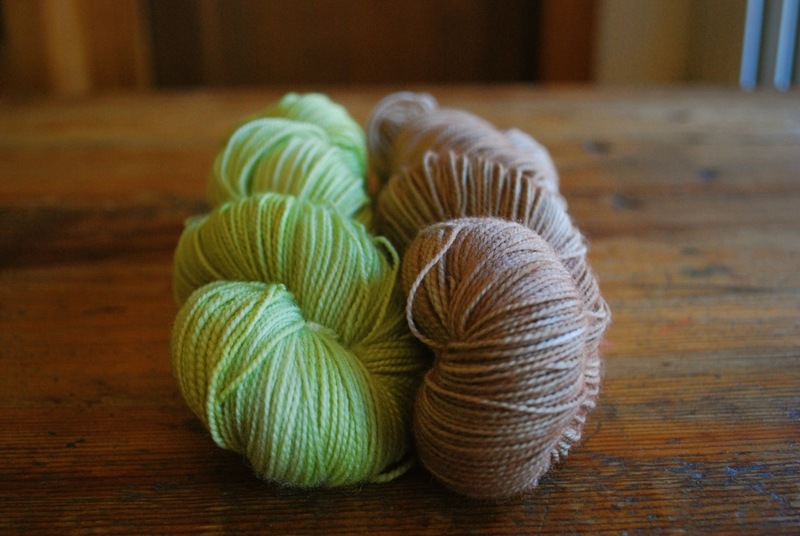 After the colorways are chosen, the dyeing is easy. My next task . . . deciding which colorways to use for booth samples. Sometimes the decisions don't get any easier. The dye pots are busy, and my days are full of color. There are earth tones, jewel tones and everything in between. Dye, dry, twist and label. The process is the same yet always different - subtle nuances, shifting colors. It never gets old. And during the process random combinations appear - colors tossed together to be packed away later. This combination caught my eye, and now I want to use it for something. Anything. Marie. Blue Jeans and Raisin. A project to contemplate while I dye more yarn. Speaking of projects I've been following a design that's under construction. Designer Becky Herrick is puzzling out a cabled sweater pattern. The twists and turns of cables can be challenging. You can read about Becky's design dilemma here. 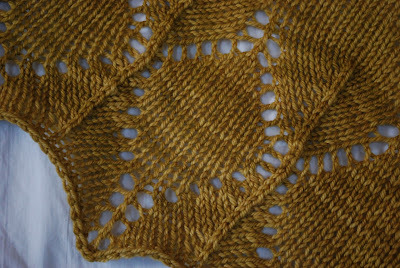 She's using Dirty Water DyeWorks Edna, colorway Acorn. I love the gray days of winter, but my color inspiration for the week is the exact opposite. 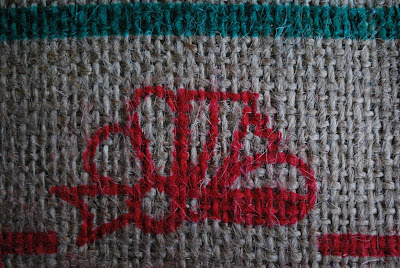 Bright and bold on burlap. 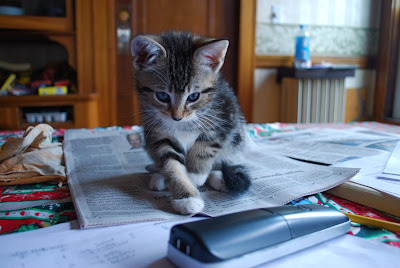 I have a new assistant. With proper training maybe he can help with some of the work around here. 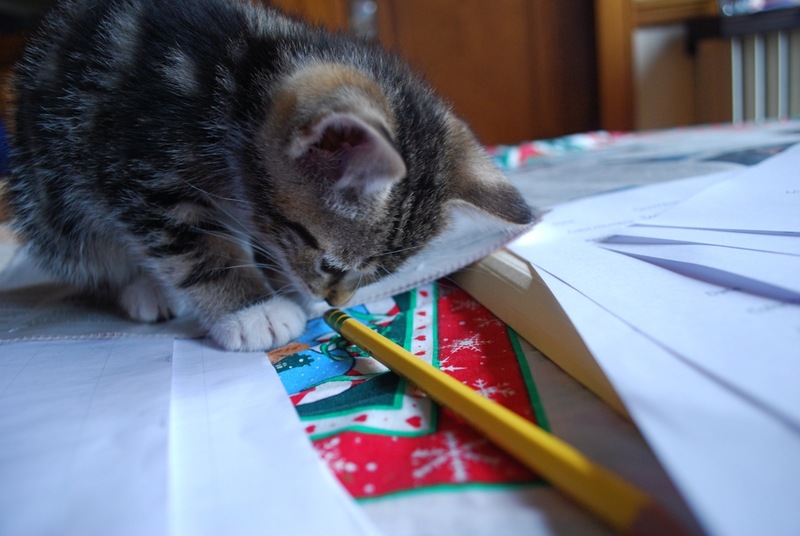 The pencil is intriguing, and there's a mountain of paperwork to go with it. Or maybe it's the phone. I hate phone calls. Any help with this would save me hours and hours of precious time. 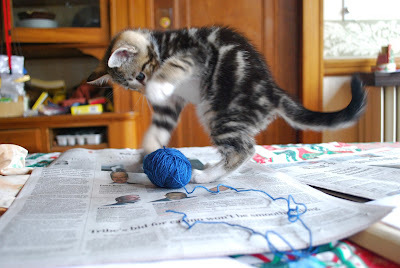 And then there's the yarn. 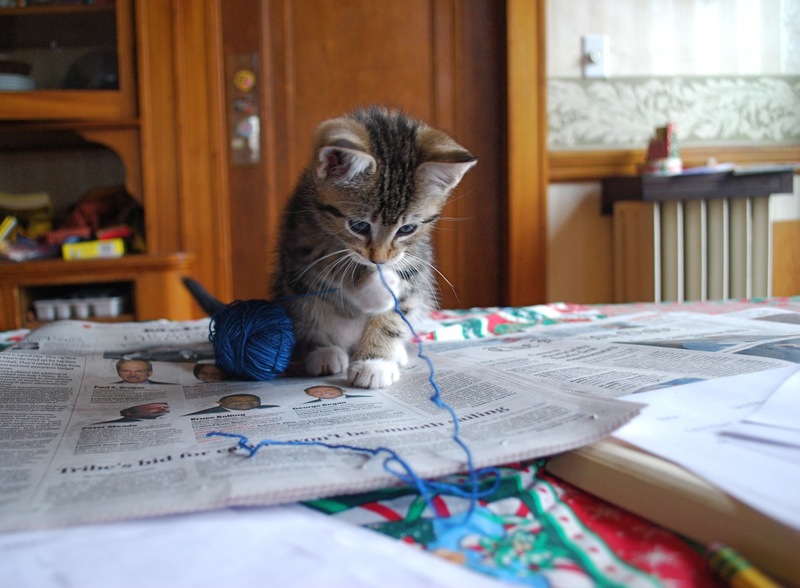 There's always plenty of work in the yarn department. Wind, dye, knit, repeat is my mantra. The yarn may be a good fit for him. If nothing else, he will provide hours and hours of entertainment. His job title? Playful distraction.